I don’t know if I’ve mentioned it before but I have a long track record of killing plants. Perhaps this is part of the reason why I’ve never owned a pet (other reason is this) . In fact, my track record has been so abysmal that is hard to believe I’m the daughter of a skilled gardener (2 in fact). 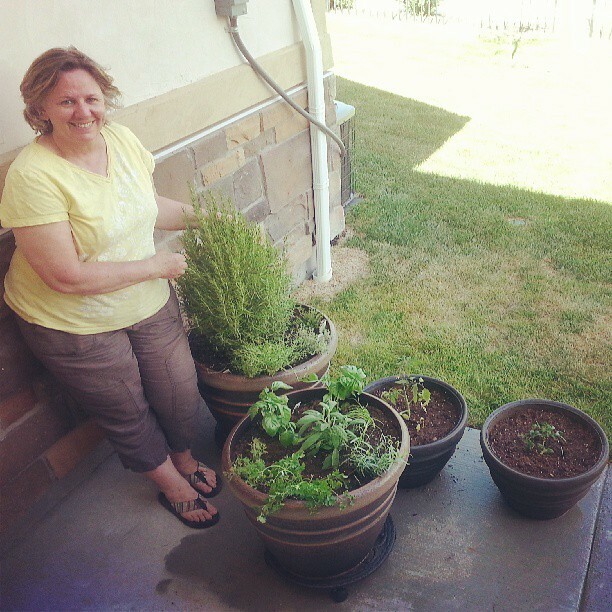 My Mom has always had the best garden on the block and knows tons about botany, soil types, and all other gardening topics (we joke that when playing boggle she knows about plants, nautical terms and fairy words (hmmm…). Anyway, I asked my Mom to help me with some planter boxes for my back patio area. I get full sun and have been yearning for home grown herbs for some time. My friend Sarah has gotten an amazing herb box inside her apartment to grow. The nice thing about having your own herbs is you can use as little or as much as you want and the cost is so much lower than the big blister package you get at the grocery store. So my parents were in town this week and originally I thought it would be a fun thing for my Mom and I to do together. Unfortunately she was busy the beginning of the week and I was busy with my boss coming into town (she organized the heck out of me! So great! More to come on that later) so it didn’t look like it would get done. Fortunately my Mother is super nice and she agreed to take on the project on my behalf. She did everything. 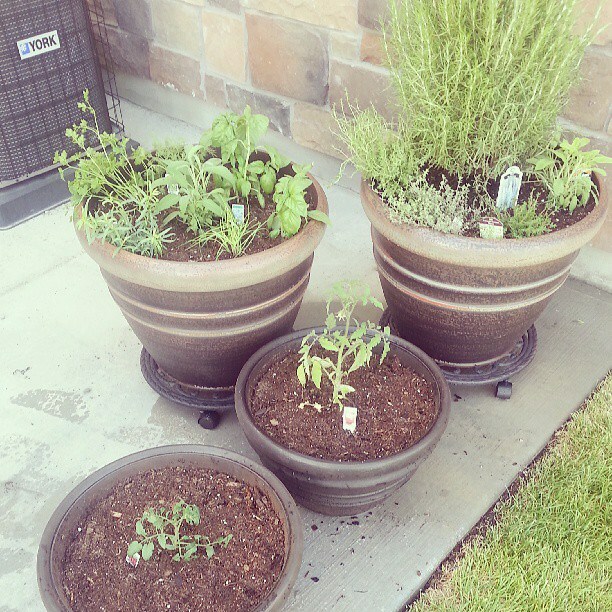 Bought the containers, soil, and some of the plants. Then today she filled, planted and watered them showing me how to take care of them. I felt bad but was also very grateful. Thanks Mom! I am now more determined than ever to reverse my black thumb and keep these plants alive! Any tips? Suggestions? Also I have 4 different kinds of mint. Favorite mint recipes please! My Mom showing her days of work! We have 2 tomato plants, basil, lemon thyme, sage, parsley, thyme, rosemary and more. She is. This was super nice! That’s a good idea. Maybe an arrangement with some herbs in it like lavender.